Just for fun we asked our kids some questions. Below are Nuey’s answers to some of the questions. I wish to be a good student. I wish to get a 4.0 at school. I wish to have lots of money. If we had an airplane to take us on vacation right now, where would you want to go? I would go to America. If all your clothes could only be one color, what color would you choose? My favorite food is eggs. My first memory is of my family. Nuey Nutnicha comes from the original Karen village of Mea Soon. Her identical twin sister Nui is so alike, it’s hard to tell them apart sometimes! Everything from their clothes, to their hairstyle, to their names are similar. You’ll never catch them without their noses in a book and they also love to help Napan prepare for dinner every night. They will be going to Mae Pang school this fall to finish their last year of primary school. 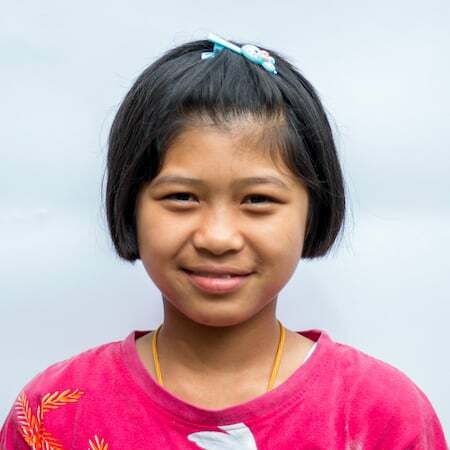 Nuey enjoys playing sports in her free time, anything from football to badminton! 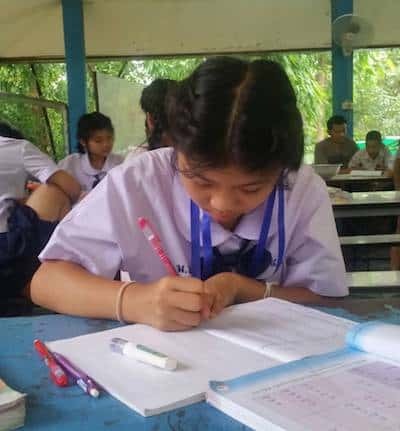 In the future, she hopes to to be a teacher.